They keep changing the A+ exams, and that doesn't mean they get any easier. 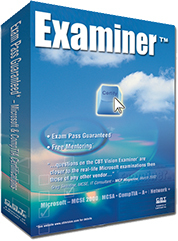 The new Examiner™ for A+ Hardware will help you master all the topics you need to know - including installing, configuring, upgrading diagnosing, troubleshooting and maintaining computers, printers and networking components. In other words, just about everything one needs to know to be "good with computers." Even better - passing this exam counts toward A+ certification can count toward achieving Microsoft's MCSA designation. CompTIA organizes their exam objectives into objective domains. The exam objectives are available from CompTIA web site and summarized for your convenience below. You should possess the knowledge and skills required to identify, install, configure, and upgrade microcomputer modules and peripherals. Know the insides of a typical PC really well. Know how to fix and replace the various components correctly. These include RAM, hard disks, CPUs and power supplies to name a few. Newer topics encompass subjects such as USB and Firewire. Diagnosing and Troubleshooting encompasses knowledge relating to diagnosing and troubleshooting common module problems and system malfunctions. This includes knowledge of the symptoms relating to common problems. If a processor, memory, mouse, floppy drive, parallel port, etc. is acting up or seems to be down you need to know the ins and outs of these problems and the direction to take to fix them. Beep costs and POST codes figure prominently in many scenarios. It's only worth 5 % on the exam but for safety's sake it could be worth your while to know all about "the potential hazards to personnel and equipment when working with lasers, high voltage equipment, ESD, and items that require special disposal procedures that comply with environmental guidelines." You also need to know how to prevent the worst from happening in any computer-related situation and how to clean the equipment. The list is long considering that this only makes up 11% of the exam. Your study and memorization time could be longer. Individual results may vary. Apart from the disks, most of this stuff inside a computer is comprised of green polymers and silicon. The latest, high-quality stuff makes your computer run faster. Become familiar with CPU chips, types of RAM, types of motherboards, etc. If you're shaky on Socket 423 and Socket 478, you're probably not prepped. This domain requires knowledge of basic types of printers, basic concepts, and printer components, how they work, how they print onto a page, paper path, care and service techniques, and common problems. That sounds almost deceptively basic to us. This category can give you some trouble. If you have never heard of charging, writing, developing, image transfer, fusing and drum cleaning in the context of laser printing you will need to do some work. You can't neglect bubble jet or dot matrix printers either. Here you will need to use basic network concepts and terminology. The scope of this topic is specific to hardware issues on the desktop and connecting it to a network. However, network technology has evolved (Wireless, Gigabit Ethernet) since the next most recent set of objectives was published and that's reflected on the exam.